Property Handbook Section 1: Overview -Muirfield Association, Inc. In 1974, Muirfield Village was created from the unspoiled rural countryside in Dublin, Ohio. This unique environmental community was designed by Jack Nicklaus, Muirfield Ltd., teams of skilled planners, architects and builders. The long vistas, woodlands, streams, lakes and open areas have been good neighbors to hundreds of families who are part of one of the premier communities in central Ohio. 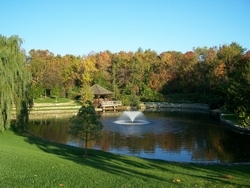 Jack envisioned the natural beauty of the land molded into a unique environmentally friendly community that met Planned Urban Development requirements and restrictions. The Muirfield concept combines exceptional design blended with the natural environment. When developing the Muirfield concept, much consideration and emphasis was placed on providing privacy for each family, the desirability of peaceful walking and bicycling paths throughout the community, and the blending of all buildings into the landscape. Nearly 2,400 families (more than 8,000 residents) call Muirfield Village home. Building and construction are at a minimum, leaving residents with a feeling of a quiet, completed neighborhood to call home. A winding complex of tree-lined streets, secluded cul-de-sacs and courts interconnect a combination of condominiums, patio homes, and single-family homes. In the spirit of Jack’s dream, the names of the streets, as well as the community itself, are taken from Scottish golf communities. 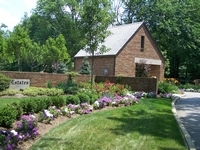 Muirfield Village lies in the northwestern corner of Dublin, Ohio and is part of Delaware and Franklin counties. There are two golf courses located within Muirfield: The Muirfield Village Golf Club and The Country Club at Muirfield Village. Thus, many neighborhoods have golf course views while others enjoy a variety of wooded lots and rolling terrain. Homes in Muirfield Village include single-floor ranches, patio homes, condominiums, large estates, and exclusive custom-built homes. There is something for everyone in Muirfield Village! Through the years, Muirfield Village has retained the sense of country while still being conveniently located near a suburban environment. City amenities, services, and some of the finest schools in the area are only a short drive away. The many services and amenities available in our community are funded by the assessment paid each year. Similar to real estate taxes, the assessment is billed a year in arrears. Currently, they are calculated at $2.20 per $1,000 of fair market value as assigned by the county auditor. The assessment invoices are mailed to owners in mid-January and are due within 30 days. The Association maintains a law-mandated reserve to defray the future replacement costs of those major capital items that the Association is obligated to maintain. When management of The Muirfield Association was turned over to the owners in 1987, a nine-member Board of Directors, the governing body representing Owners, Residents and the Association, was formed. These nine residents voluntarily dedicate their time and talents to serve the interests of our community. They are elected to three-year terms during voting at an annual meeting. Director terms are staggered so that each year, three members are elected to serve three year terms. They must be residents in good standing whose member rights and privileges have not been suspended and they must be able to attend the bi-monthly meetings. The directors are dedicated to long-term good management, controlled growth and fiscal responsibility. Their thoughtful concern ensures reasonable protection of each owner's environment. In accordance with the ORC 5312, owners elect members to the Board of Directors from among the owners and their spouses. Owners not eligible to be elected to the Board of Directors include: those who are not an individual; any principal; member of a limited liability company; partner; director; officer; trustee; or employee of the owner. The Board of Directors is responsible for setting policies pertaining to the Muirfield Warranty Deed and Articles of Incorporation. They approve the annual operating budget and capital expenditures. The Board meets at the Association office on the third Wednesday of every other month. A General Manager has been retained by the Board of Directors to oversee the day-to-day operations of the Association which includes a well-informed office team, and a skilled full-time and part-time maintenance crew. You may see the maintenance crews working in your neighborhoods and in the common areas, however, all service contract requests must be submitted to the Association office and must not be made of staff in the field or working at facilities. The Board of Directors appoints members to the Muirfield Design Control Committee (MDCC), made up of staff and professionals for reviewing, evaluating, approving and disapproving exterior additions and changes to Muirfield properties. The MDCC is charged with enforcing Muirfield standards to protect the deed restrictions and aesthetics of the community. Besides reviewing exterior property changes, they are also charged with enforcing the deed and pursuing correction of violations of the Warranty Deed and Design Standards. The Directors and MDCC expect residents to monitor their own activities. As needed, they work diligently to see that the deed and design standards are upheld. In accordance with policy, specific procedures are followed to alert residents when a violation is noted. Legal action may be taken against owners as a result of a violation that fails to comply with the deed and adopted design standards. The Grounds & Facilities Committee, made up of resident members, serve as liaisons to the Board of Directors. This committee gathers recommendations and makes suggestions to the Board of Directors pertaining to the maintenance of pathways, landscaping, lakes and capital projects for the common elements as well as making recommendations pertaining to the rules, maintenance, safety, programs and capital projects for the pool and tennis facilities. The Grounds & Facilities Committee meets with the General Manager at the Association office on the last Monday of each month, March through November. The chairman of the committee provides a report at the Board of Director meetings. The Muirfield Social Activities Committee, made up of resident members, serve as liaisons to the Board of Directors. This committee develops, plans, funds, organizes and staffs social activities/events for all Muirfield residents. The Social Activities Committee meets with the General Manager at the Association office. The chairman of the committee provides a report at the Board of Director meetings. The Civic Action Committee, made up of resident members, serve as liaisons to the Board of Directors. This committee monitors activities/developments of areas that may impact the general well-being of Muirfield residents. This committee will organize, monitor, attend meetings as needed, keep informed of pertinent actions, and alert the Board of Directors of such activities. The Civic Action Committee meets with the General Manager at the Association office. The chairman of the committee provides a report at the Board of Director meetings. The Muirfield Garden Club is a separate group comprised of residents with interest in gardening and flowers. They meet in member’s homes, usually on the second Monday of each month, March through December. The purpose of the organization is to stimulate knowledge of gardening, to advance civic beautification, and to promote conservation of the natural resources in our community. This active group contributes time and talents to the Dublin Library, the Women’s Reformatory in Marysville as well as sponsoring a Junior Gardening Program for Muirfield youths. Proceeds from the club’s fund-raisers are used to beautify and enhance Muirfield’s common elements and the courtyard at the Dublin Library. The Muirfins Swim Team is an independent club exclusively for Muirfield youths. Practices begin in late May and the season ends with a championship meet in mid-July. All families in good standing (without deed violations or delinquent assessments) are welcome to join. For more information about the Muirfins Swim Team, email the swim team at [email protected]. The Association maintains an interactive website at http://www.muirfieldassociation.com with general information about the community, activities and events, and groups. Guidelines and applications for design review, the Warranty Deed, Bylaws, and Articles of Incorporation can be downloaded. A members area offers owners the opportunity to read minutes and download annual meeting materials.